July 20, 2012, 12:30 p.m. The German broadcaster is using SMS and dial-to-listen radio shows to reach an audience with limited Internet access. By Antonio Jiménez @eleditor July 20, 2012, 12:30 p.m.
As the fastest-growing mobile market on the planet, Africa is facing huge opportunities — and distinct challenges — in news dissemination. No Internet access necessary: Just dial a number to access the program Learning by Ear, an educational show for teenagers that mixes news and explainers having to do with health, politics, the economy, the environment, and social issues. The show’s already available in languages like English, French, Hausa, and Swahili. In the past year, it was introduced in Tanzania and in Niger. The plan is to launch the program in four more nations — Ghana, Nigeria, Rwanda, and Liberia — “within the next weeks,” Naser Schruf, Deutsche Welle’s head of distribution for Africa and the Middle East, told me in an email. The idea is to help give young people access to information that otherwise may not be available. One ongoing Learning By Ear series on women’s rights, for example, features episodes on topics like female circumcision, sexual harassment, child labor, leadership and “careers for girls.” “They are narrated by African native-speakers which makes it even easier for the audiences to identify,” Schruf said. Deutsche Welle also gave the show an on-demand feel by enabling people to shift between episodes, as well as pause and later return to the point the show stopped. Essentially, Learning By Ear turns your phone into a remote control for audio, Schruf said. Deutsche Welle is also experimenting with news-by-text distribution. It launched a Swahili-language pilot project called SMS News Services 18 months ago in Tanzania. The subscription service distributes two to five text-messaged daily news updates, with a focus on international and breaking news, at a cost of 100 Tanzanian shillings per day, or about US$0.06. Sports-related updates will be added in coming months. “For Deutsche Welle, it is crucial to provide Tanzanian info-seekers with the information they need and from a different perspective, that of an international broadcaster,” Schruf said. Deutsche Welle wouldn’t provide subscription numbers but Schruf says the service is gaining momentum. “In view of the market and its limited resources, we can say that it is a successful story so far.” Many of those who haven’t yet connected to the Internet from desktop computers are now getting access via phones for the first time. The ability to get information to a hard-to-reach population is a victory in and of itself. At the same time, Schruf acknowledged, Deutsche Welle is still trying to find new ways to facilitate more interaction through mobile phones, and give users “a ‘voice’ in current events,” possibly through features like SMS-based polling and commenting. The bottom line for Deustche Welle is to distribute news and information to the “widest possible audience,” especially in African markets where web penetration is low or non-existent. “Mobile phones have succeeded in an area where the web has found success difficult to come by,” Schruf said. 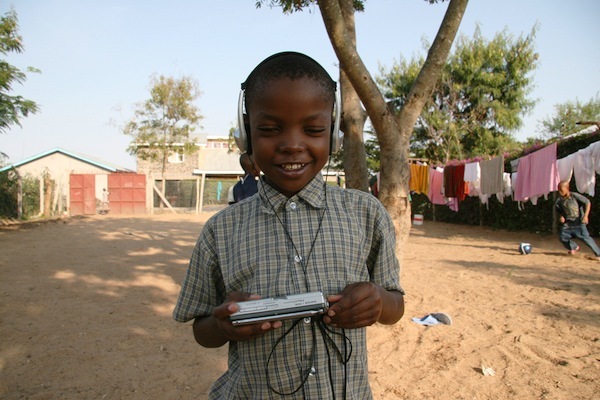 Photo of a boy in Arusha, Tanzania, listening to his radio by Charles Anderson used under a Creative Commons license. POSTED July 20, 2012, 12:30 p.m.
Jiménez, Antonio. "Deutsche Welle’s trying to use Africa’s mobile-phone boom to spread news by new means." Nieman Journalism Lab. Nieman Foundation for Journalism at Harvard, 20 Jul. 2012. Web. 24 Apr. 2019. Jiménez, Antonio. "Deutsche Welle’s trying to use Africa’s mobile-phone boom to spread news by new means." Nieman Journalism Lab. Last modified July 20, 2012. Accessed April 24, 2019. https://www.niemanlab.org/2012/07/deutsche-welle-and-how-its-taking-advantage-of-the-mobile-boom-in-africa/.